When the travelers entered the inn, they were met with the welcoming blaze of a fire in the hearth. At this time of year, the garden is a blaze of different colors. In a blaze of anger, Joe told his colleagues exactly what he thought of them. The sun blazed in the blue sky. "What makes you think you're better than anyone else," Jane blazed at Paul. Blazes on the trees show the path to follow. The organizers blazed the trail for the hikers to walk. Clara's research has blazed the way for climate change solutions. go to blazes: go to hell. Example: “I don’t care what you think; you can go to blazes!” Blazes can be used in place of hell in other expressions, such as “What the blazes?” or “What in blazes?” but it is a little dated now. 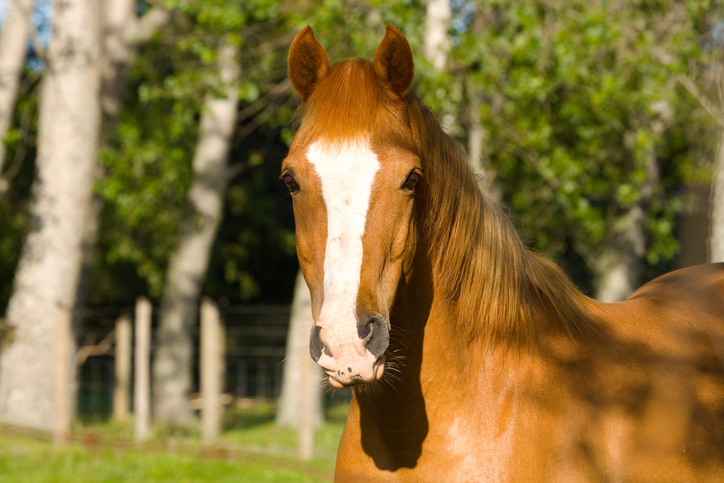 A blaze is also a white stripe down the front of an animal’s face, especially a horse. A blazer is a light, suit-type jacket. They are now often worn with sports clothes or as part of a school uniform, but originally they were brightly colored, which is where the name comes from. Blaze dates back to before the year 1000. The Old English noun blæse (blase in Middle English) meant ‘torch or flame,’ can be traced back to the Proto-Germanic adjectival prefix blas– (shining or white), from the Proto-Indo-European root bhel– (to shine, burn or flash). It is related to the Old Saxon blas (white or whitish), the Middle High German blas (‘bald’ or ‘white or shining’), the Middle Dutch and Dutch bles and German Blesse (all meaning ‘white spot’), and the German blass (‘pale or whitish’), as well as the Greek phlegein (to burn) and the Latin flamma (flame), fulmen (lightning) and fulgere (to shine or flash), and many modern English words, including black, blanche, blank, blanket, blend, blind, blond, blue, flagrant, flame, inflame and even flamingo. The verb, meaning ‘to burst into flame,’ as well as ‘to burn brightly,’ comes from the noun, and dates back to around the year 1200. The noun blaze, meaning ‘a light colored mark or spot‘ (on an animal’s face), dates back to the early 17th century. It first appeared in Northern dialect, and probably came into English from the Old Norse blesi (white spot on a horse’s face). It may not have come from the other meanings of blaze, but its origin can be traced back to the same Proto-Germanic root. The sense ‘a mark on a tree’ (for a trail) dates back to the mid-17th century, and was originally a figurative use of the meaning ‘a white spot on an animal’s face,’ since the most common way to mark a tree was to cut a bit of bark from it (leaving a white mark). The verb meaning ‘to mark a trail’ dates back to 18th-century US English, and comes from the noun.